Create a perfect display for your 3 x 5 flag and accompanying certificate or medals. 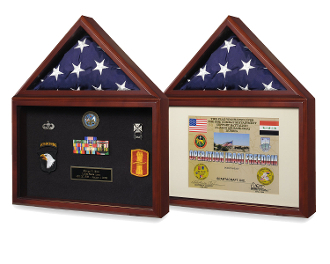 The Fathers day Flag and medal display box - Shadow Box is Ideal for storage of flags flown over the Capitol along with certificate. Predicate mat is included to fit a standard 8 ½ x 11 certificate. The Air force Flag and medal display box- Shadow Box is designed to be hung on the wall, but can be placed on a shelf. The Air force Flag and medal display box - Shadow box Part is 10.25 inches wide X 15.5 inches tall and 2.38 inches deep. 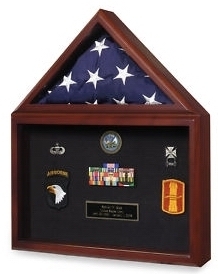 Orders for the Fathers day Flag and medal display box- Shadow Box are usually shipped out within one business day to places within the USA and Canada. If you are looking for a flag and medal display case, shop with the best. I wanted to show off my husbands medals and unit flag from his last deployment. He will be home for Christmas, and I wanted him to know how proud we are of his service. I wasn’t sure where to start looking for a flag and medal display case, and then a friend told me about Flags Connections. This online display case superstore carries everything but the kitchen sink, and I was thrilled with the selection of flag and medal display cases available. Because Don has quite a few awards and medals, I wanted something that would display them all, along with his unit flag. I found a couple that were suitable, but knew that I had found the right one when I discovered the Deluxe Combo Awards Display Case. This finely crafted wood case has plenty of space for all of my husbands medals and awards. There is even a space for his Air Force photo. Available in oak, and walnut, you can also choose the velvet background. The rich colors include red, blue, green and black. I chose blue because it really makes Don’s medals stand out. Black on Brass Engraving is also available and you can select one, two, or three lines. 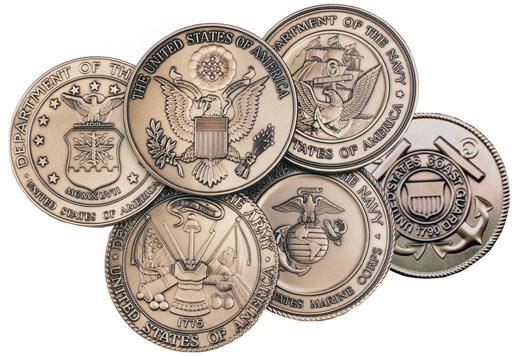 I also ordered the Military Service Medallions in Solid Brass. After I loaded up my shopping cart with the oak flag and medal display case with the blue velvet background, I decided to continue shopping. After all, my husband would be home after serving in Afghanistan for almost three years, and I wanted to show our support. I ordered the Indoor Air Force Flag with gold fringe and pole kit, and I know he will love it.